How do I create, retrieve, and/or change password, or contact information? To create a new user account, click "Log In" in the upper right hand corner of the screen. You will then redirected the log in page. Towards the bottom you will see "If this is your first time visiting this site, you must create an account." This will start the process to set up your account. To retrieve and/or change your password, just click "Reset password" from the log in screen. It is very important to keep this information up to date so we can contact you about new programs, and coaches can contact you about practices and games. Please be sure you have SMS-Texting notifications enabled for your account. Add a mobile phone number to your account. 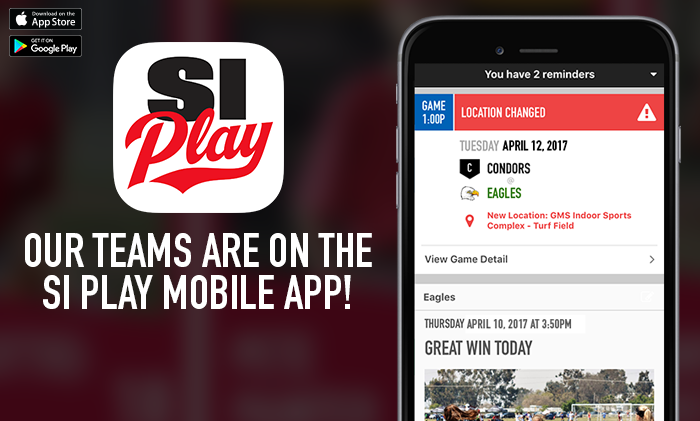 If one has already been added, then choose "Enable Texting"
Once you have your account setup, you can download the SI Play Mobile App. To get the app, click the link below from your mobile device. Withdrawal requests must be submitted to the Sport Director via email. If you have a valid medical reason or relocation related to your request to withdraw, please provide that information when you make your request. Ascension Parish requires all families to volunteer for a minimum of 4 hours during the fall - spring sports season (school year). Families have the option to pay a one-time buyout fee of $100 that will cover all sports for that school year. Uniforms are the property of Ascension Athletic Association. Uniform return dates will be issued for each sport upon completion. Failure to return a uniforms will result in forfeiture of equivalent funds either through deposit checks or as a reference charge against the credit card on file. Children will not be allowed to participate in future sessions until the uniform as been returned or penalty paid. The West County CYC district requires that all players 5th grade and up require CYC ID cards. Some sports like track, require participants of all ages to have a CYC card. All players, head coaches, and assistant coaches must have a valid CYC ID card with them at each game. In most cases, the coach will keep these for the players during that season. The purpose of these cards is to assure the accuracy of the team roster. For children they are valid for six years; for adults they are good for a lifetime. One ID can be used for all CYC sports, but we recommend purchasing multiple cards if your child plays multiple sports. Who Can Play Ascension Sports? All players must either live in the parish boundaries, attend Ascension school or PSR, or are registered parishioners. Can non-Catholic children play for Catholic programs? Yes. There are no religious restrictions imposed by the CYC concerning player participation. Are any players ineligible to play in CYC sports for Ascension? Reside in the parish boundaries. If you belong to another parish or reside in their boundaries and they do not have a team at your age level, then you may apply for a waiver from your parish to play with Ascension. Open players that do not meet any of the above criteria, will not be allowed to play at Ascension. The "Open" and "Closed" team designation is a CYC method used to ensure equity for those teams that qualify for the City/County Postseason Tournament. WCSL does not need the "Open" and "Closed" designation for teams because they do not offer a postseason tournament against other area leagues. This means the Ascension player does not play the same sport for any other team. A team is not designated as "Open" or "Closed" until 5th grade. During the regular season "Open" and "Closed" teams may play each other, but the games against a team of another designation will not unfairly affect the team’s ability to qualify for the post-season tournament. All "Open" teams will not necessarily be placed in a more competitive division than all "Closed" teams during team placement. It is possible that a "Closed" team will be better than an "Open" team in a particular age/gender group. The goal is to form competitive divisions for all teams. There may be divisions with all "Open" teams, all "Closed" teams, or a combination of both "Open" and "Closed" teams. The classification is used only to designate whether a team plays in the "Open" or "Closed" Tournament at the end of the season should they qualify. A coach cannot designate that his/her team will be "Open" or "Closed". Ascension will not be forming teams in an effort to qualify and/or win a City/County Postseason Tournament. If a team qualifies for the postseason tournament, it is a bonus.